High Focus Records is a record label specialising in a diverse range of UK Hip Hop. Based in Brighton, England, High Focus Records have now been putting out music since 2010 and during that time, they have gone from strength to strength. With a YouTube channel that boasts over 1,000,000 views, High Focus Records already had a an existing online presence and an avid fan base. Furthermore, the team had also been exceptional at content marketing and consistently pumped out digital content. 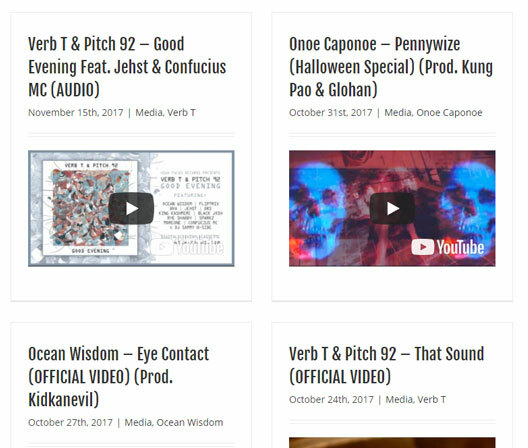 Upon further inspection of their original site, the High Focus Records team had already published over 1,500 blog posts, press releases and videos, amongst other pieces of media. Over the years and due to the frequency of these updates, the original High Focus site (Originally built in 2010) started to become a little sluggish and furthermore, was based on outdated design practises. This was a problem for the High Focus team as it didn’t match their otherwise strong digital marketing efforts. On consultation with the High Focus team, we realised that it was important to design a website that essentially acted as a hub for all the wonderful pieces of content that High Focus were producing. 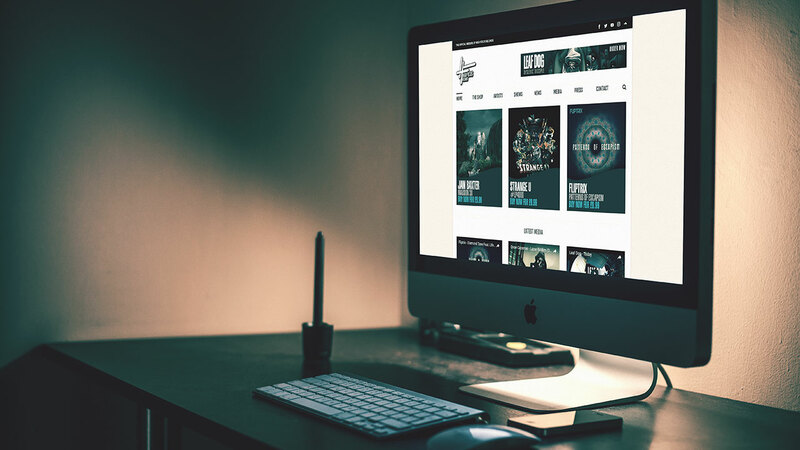 During the website design process, we looked towards media companies such as Vice News, as opposed to drawing inspiration from traditional record label sites (Sony, Universal etc). This is because we found that the more often than not, the established legacy record labels often came across as too salesy, or with too much of a PR focus which we felt didn’t match the authentic, guerilla and home-grown feel of the High Focus brand. We decided to create a homepage that displayed all of the different pieces of content published by High Focus. 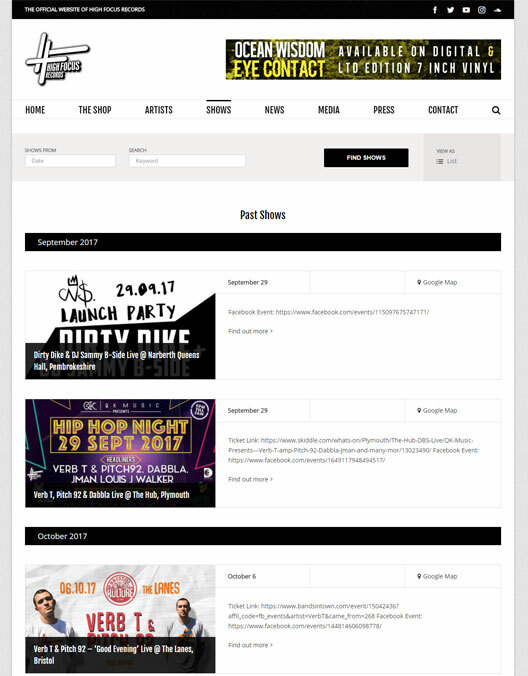 Within the fold, we gave prominence to the revenue driving aspects of the brand by including links to the latest music releases within the store. From here, the rest of the homepage is populated by dynamic content, for example, the latest videos are pulled in from YouTube and the various pieces of latest on-site media are retrieved directly from their corresponding sections. This Dynamic system allows the High Focus team to focus on the most important element of their website – the brands multimedia content. 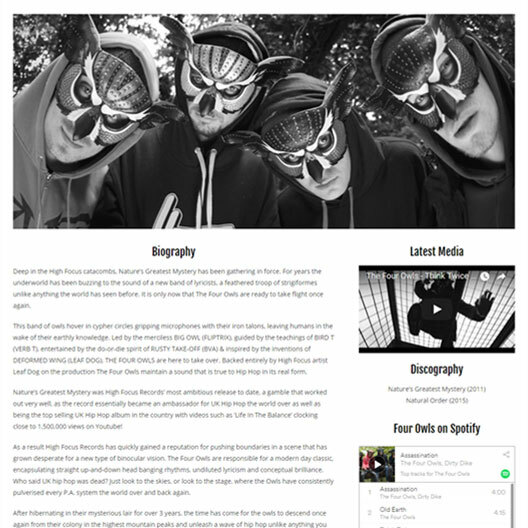 Another important aspect of the new High Focus Records website is the artist pages. Previously, they were simple pages that included a picture and biography, however much more could be done to improve these pages. 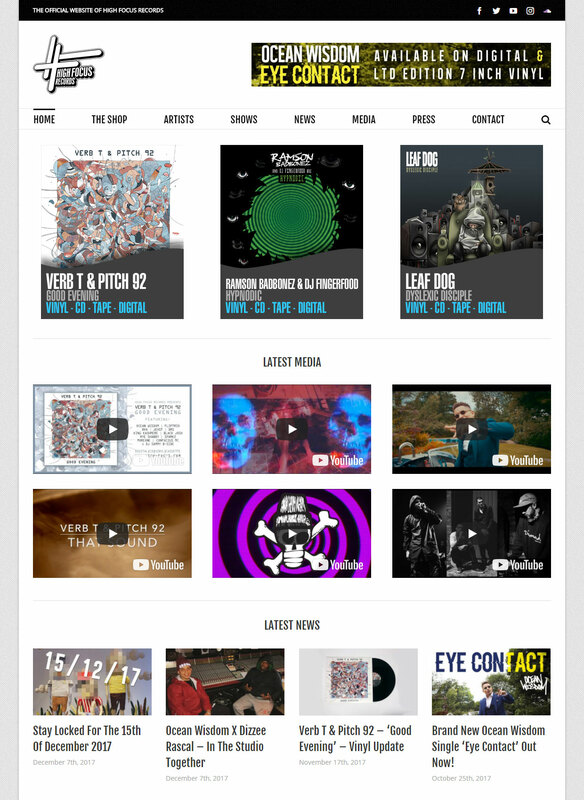 The first new addition to the artist pages was the Latest Media box that pulls in the latest video for the respective artist. Below that, we have the Discography section that highlights the artist’s library of music. We then have the Spotify embed that displays the artist’s Spotify profile and can also be used to play songs right there in the browser. Finally, we included a section that links to all of the artist’s social media profiles. These new features make it incredibly easy for fans of an artist to gain access to the music and information they want without having to search elsewhere. The artists at High Focus Records frequently perform shows and appear at various festivals across the globe! With that being said, their previous live shows section was letting them down, and simply existed as a blog post category with outbound links to ticket vendors. Because we are highly aware that live shows are an integral part of any record label, for the High Focus project we wanted to ensure that this section had some prominence on the site. This meant that the system needed to be replaced with something much more suitable. With that in mind, we got to work on designing a system that did just that. The new shows system now includes a dynamic search box that allows fans to search for events by date or keyword, and displays these shows by either list or calendar depending on which option the user selects. We also placed a dedicated info sidebar on the shows page that displays all of the important information such as dates, locations, a map, price and where the tickets can be booked. Social sharing links are also integrated to allow fans to share the shows via social media. 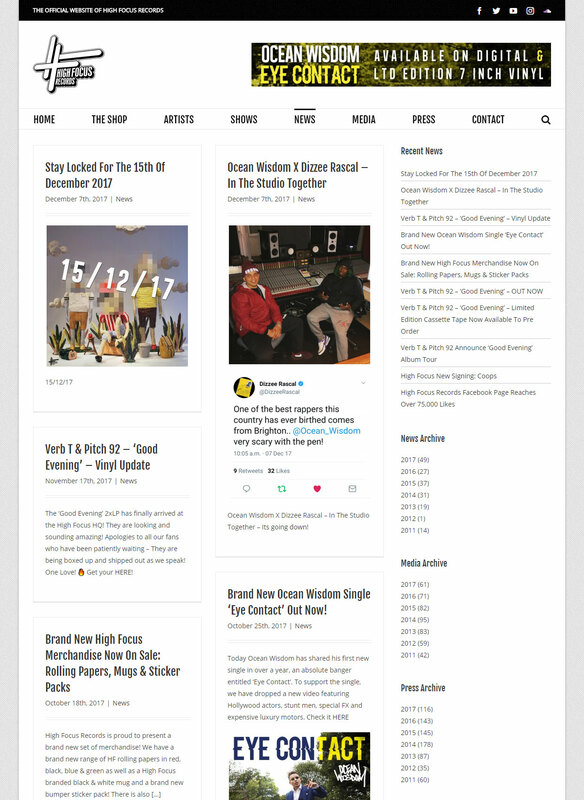 Our changes to the News, Media and Press feeds of the High Focus Records website were more simplistic than the Shows and Homepage changes, however we still wanted to clean them up and improve the way in which the content was presented. To accomplish this, we have displayed the content in a 2 column feed layout in their own subtle boxes that allow fans to easily distinguish between separate pieces of media. The sidebar has also been tidied up and enables easy navigation of vast amount of content on the High Focus website. If a post includes an image within, that image will get pulled into the feed, allowing for a more visual and interesting browsing experience. 12K unique sessions per month with over 19k page views. Three unique streams of revenue driven directly by user activity on the site (store, streaming revenue, YouTube ads).